The month’s going fast, isn’t it? Gentle reader, be cautioned: comments sections on mainstream media sites tend to not be safe and we here at FWD/Forward don’t necessarily endorse all the opinions in these pieces. Let’s jump right in, shall we? Clearly there are two ways to view every situation. I am wondering about all of you. Was the curtain a thing designed to give privacy or was it something which indicated the hiding way of shameful movement? This bullying of innocent families (who, let’s be honest, have enough on their plate) must stop. The Government is relying on the apathy, relative inertia and fear of the disabled community to make life hell for the people who deserve it least. No other group in society is so reliant on the Government from birth as people like myself who are born with a disability. We must support each other, and band together to tell whoever is behind this vendetta against good, hard-working families who are dedicated to their kids, that enough’s enough. “We looked at everything from the Facilities Accessibilites Design Standards checklist, the updated building code and for accessibility, said Karen Ellison, the city’s election co-ordinator. United Kingdom: ESA: It Doesn’t Add Up by lilwatchergirl at Through Myself and Back Again. No wonder there’s so much anxiety around the ESA medical assessments. Anxiety that won’t help those who already have long-term illnesses, or mental health problems, or acute life-threatening conditions – or who are already living in fear and poverty as a result of the War on Welfare Claimants. When Persistence Pays Off by Emma/Writer In A Wheelchair at Disability Voices. I’d love to think that they’ve done this just because of my complaints but I’m not naive enough to do so – and I know I’m not the only person whose had those problems. But it’s a definite example of why complaining, campaigning and advocacy are so important. And what happens when your persistent – because it really can pay off. Statistics on Accessible Tourism – a Continuing Issue by Ivor Ambrose, guest posting at Access Tourism NZ. One of the most Frequently Asked Questions posed by business owners and tourist agencies is: “How many disabled tourists are there”? And then there is the more probing question: “So, if it is not just about disabled people, how many people actually need better access, and what kind of things do they need?”. Canada: Ottawa makes voting easier for disabled from CBC News. 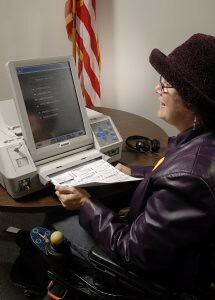 The new voting machine, called a Voter Assist Terminal, has a high-contrast touch screen with a zoom function to enlarge type size. It also has tactile buttons with Braille on them; a sip/puff device for people with limited mobility; a rocker paddle; and an audio function that enables voters to hear the choice of candidates through headphones. A New Financial Access Frontier: Persons With Disabilities by Elisabeth Rhyne at The Huffington Post. According to Harvard Law professor Michael Stein, 650 million people around the world, nearly 10 percent of humanity, have a disability, and over 80 percent of these people live in developing countries. Yet, in research studies, fewer than 1 percent of the clients of microfinance institutions, dedicated to serving the world’s financially excluded people, were found to be persons with disabilities. Here in the United States, we are in the midst of a midterm election cycle, and given that campaigning for Presidential elections basically starts two years in advance, we are about to start ramping up for the 2012 Presidential election, which looks like it is going to be a doozy. I’ve always been mesmerised by the electoral process. Growing up, our house was used as the polling place for the community, and my father always let me take the day off from school to watch the voting. I clamored to turn on the radio for election results like other children screamed for ice cream. I’m somewhat more cynical about elections, voting, and enfranchisement these days. Last September, the governor [David Paterson of New York], who himself has a disability, shocked many when he vetoed a group of disability bills mostly centered on rights provided through the federal Americans with Disabilities Act, including voting place access. This article goes on to discuss the voting access aspects of the legislation Paterson vetoed in more detail, pointing out that many of the claims he made about the legislation were false and illustrating that funds are made federally available to address accessibility issues at polling places. There is no reason for a polling place to be inaccessible, ever, and it is horrific that the Governor felt it was appropriate to veto a bill that included, among other things, polling place accessibility. It was only whilst walking home with my partner that we compared notes. It appeared that my template had been placed fairly close to the left hand edge of the form, and my partner’s had been nearer the middle of the form. We phoned a friend and asked where the boxes appear on the ballot paper and were told that they are down the right hand side. It would therefore appear that both our ballot papers are spoilt and we haven’t had a vote in this very important election. The thought that anyone would be denied that right and that experience makes me indescribably furious. Actively working to deny people the right to vote is nothing short of repugnant. So is denying people the right to vote in confidentiality; a polling place is not ‘accessible’ if voters are required to disclose their votes to a poll worker to get their ballots cast. It is not ‘accessible’ if the only wheelchair-accessible space to vote is a table in the middle of the room where everyone can see. An estimated 20% of the population of the United States is disabled. That’s a pretty big percentage of the electorate. Given that we are not actually a hivemind, it’s safe to assume that we have some very diverse views on politics and that those of us who do vote probably vote very differently. Those of us who can’t vote would vote differently as well, if they were given an opportunity to do so. It’s important to make sure that these voices are heard, to ensure that votes are cast not only by people who can walk up the stairs to a polling place, stand at a polling booth, and interact with a touchscreen or paper ballot, but by everyone. 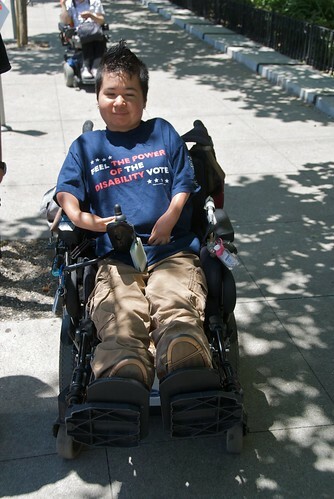 There is absolutely no reason to keep polling places inaccessible, unless, of course, you are afraid of the power of the disability vote.